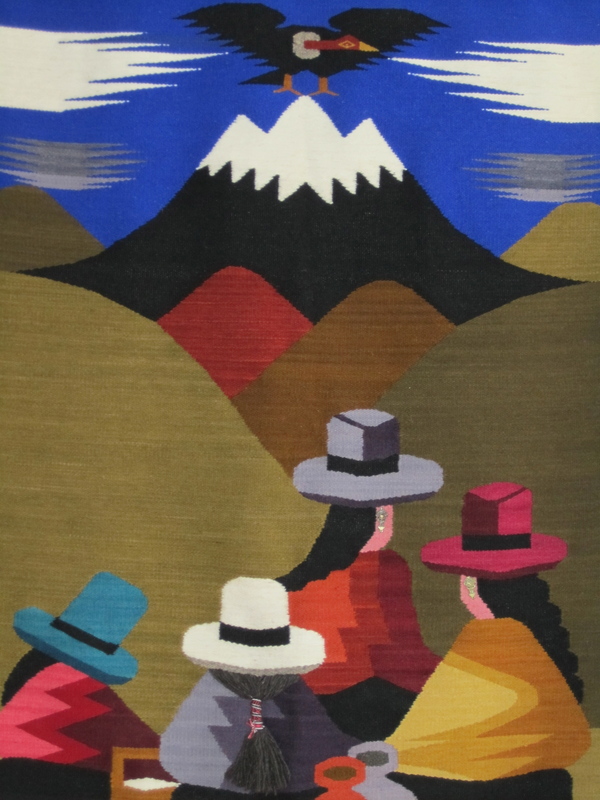 Although we didn’t reach Ecuador until the evening, we knew we had arrived when women (and a few men) began boarding the bus in beautiful indigenous dress. As we tried not to stare at the amazing outfits (and readjusted to hearing prices in dollars), excitement grew at the thought of exploring a new and different county. 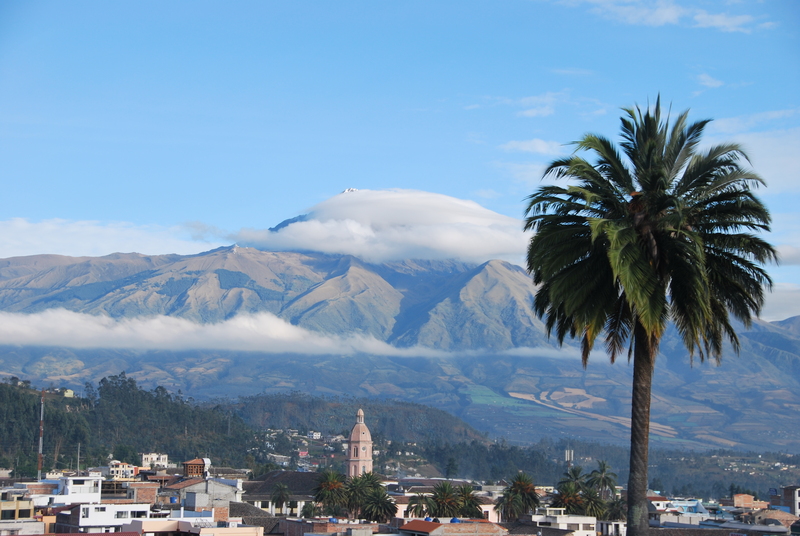 We arrived late on Friday evening into Otavalo. After 16 hours on the road, we were longing for a nice shower and a soft bed. We found both at Hotel Chasqui, run by one of the nicest Ecuadorean men, Roberto. He showed us to what we thought was the penthouse, and we happily accepted these lush accommodations. Our room was located on the top of the hostel, had its own terrace, great views, internet, bathroom, and a soft bed. We’re not sure how we scored the nicest room in the place, but we were stoked. Seeing how we were going to spend a week in Otavalo for Spanish classes, we were thankful to have such a comfortable place to stay. At $18 per night, it was a steal! Spanish classes were on the top of the agenda for our time in Otavalo, and Joe could not have been more excited to impress his teacher with his mad skillz. We met our teachers early on Monday morning and began our quest to improve our Spanish for the next week. We would typically have four hours of class in the morning, a two-hour lunch break, and then some type of activity in the afternoon. During these activities, we would learn about the local area and put our knowledge into practice via conversations. 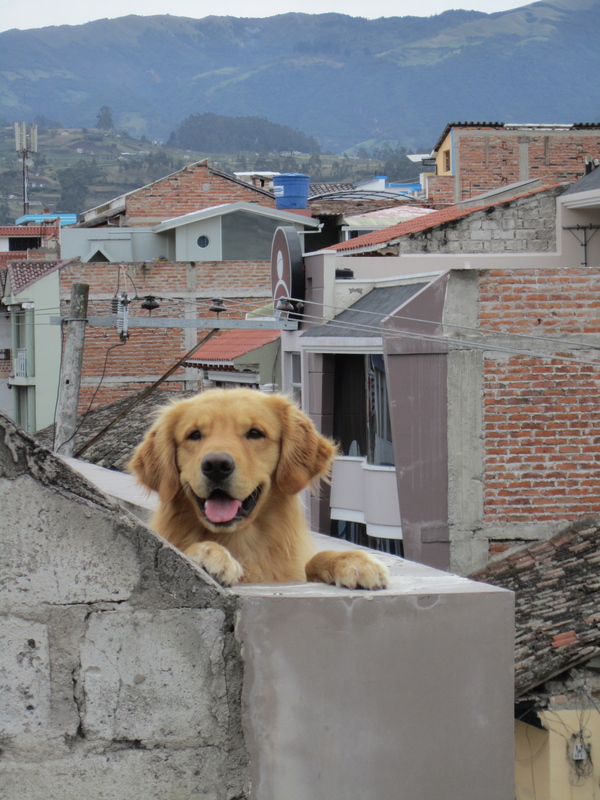 In addition to the teachers, there was a friendly, smiling dog next door and he made break time more entertaining. One afternoon, we headed to a museum which depicted and discussed the various local indigenous people in this area, including their clothing. 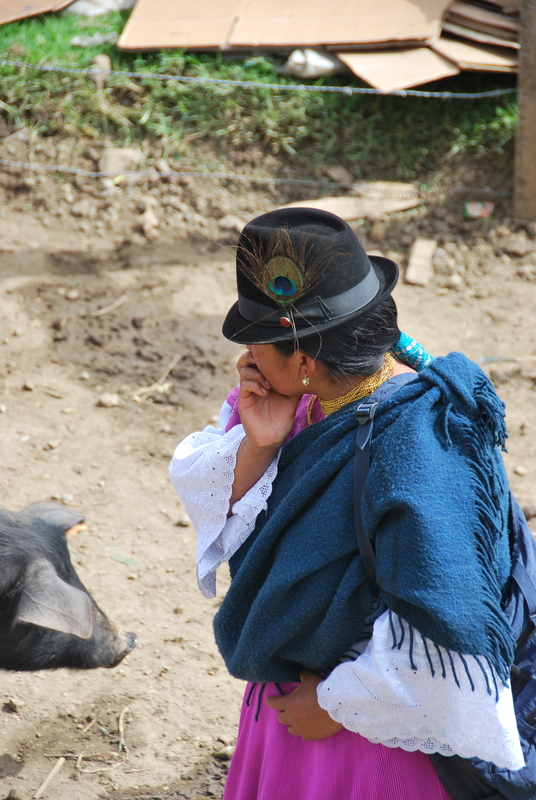 Otavalo is surrounded by many different indigenous communities and it was interesting to see them all in town wearing their traditional clothes. 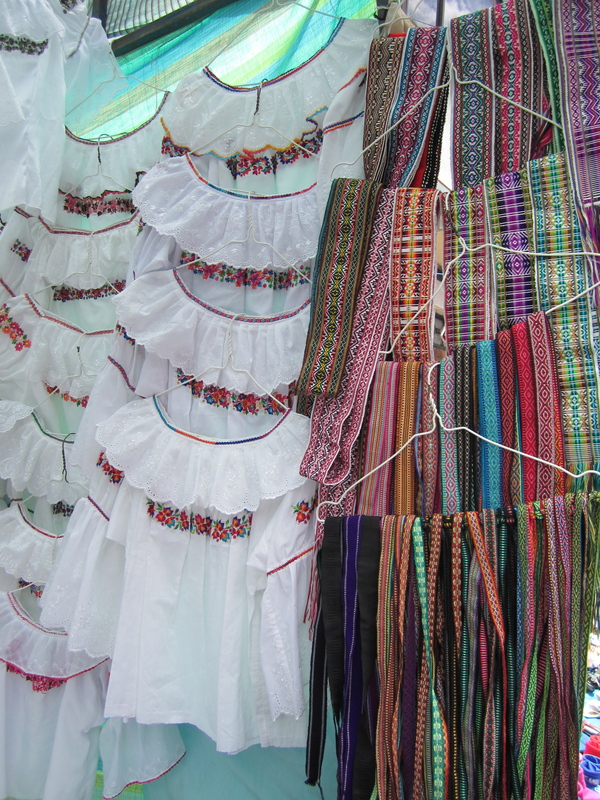 The women’s blouses were hand-embroidered and gorgeous. We wanted to take so many pictures of the women in their dresses, but we feel weird about taking pictures of people. The pictures that we did manage to get are from some pretty weird angles and far away, but they’ll at least give you the general idea. 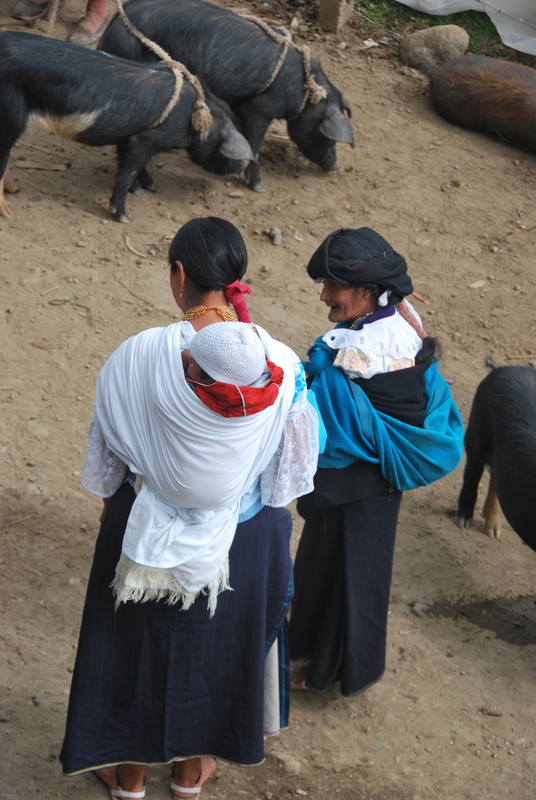 Typical beautiful dress and we love how they carry their babies! One day, the entire school of struggling Spanish speakers headed out to enjoy an Ecuadorian speciality… cuy. If you don’t know what it is, look it up if you are brave. Being brave ourselves, we tried only a little bit before deciding that chicken is more our speed. While the meal was prepared, we played a game with our fellow students, and we all had a good time trying to impress each other with our vastly improved Spanish skills. 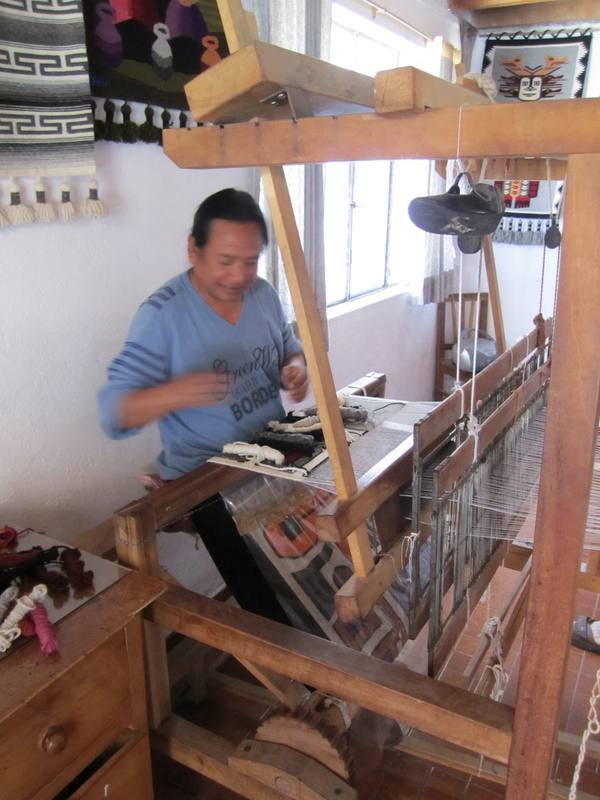 Putting the lunch behind us, we were shown to a local artisan’s house to learn and try our hand at making textiles. The place was run by a very nice couple who had been married for fifty years, and we were entertained by their adorable grandkids. First step was prepping the wool. 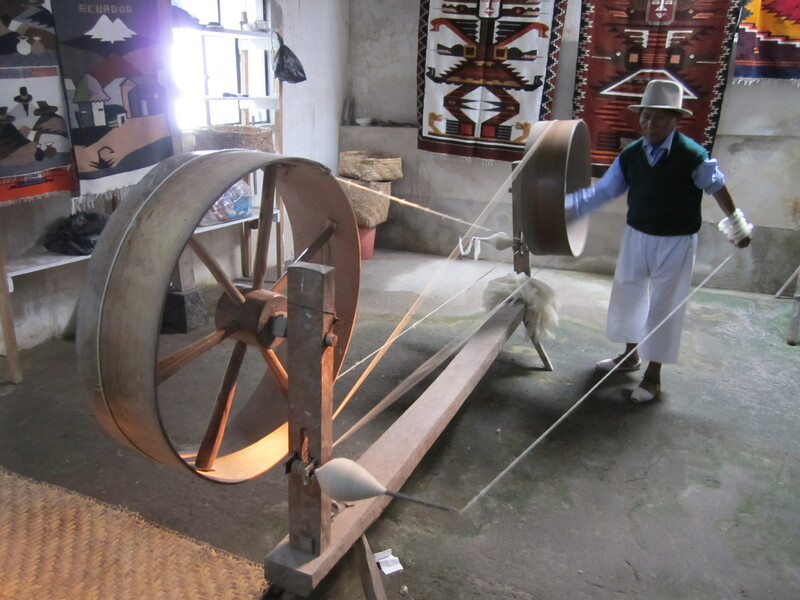 Next, the wool is spun into yarn. This machine is really old but still does the job. Finally, it is woven in to the beautiful pattern or design. A lot of hard work! FYI… this man is 79. We just stood back impressed. On our final day with the class, we had a morning field trip with the rest of the students. 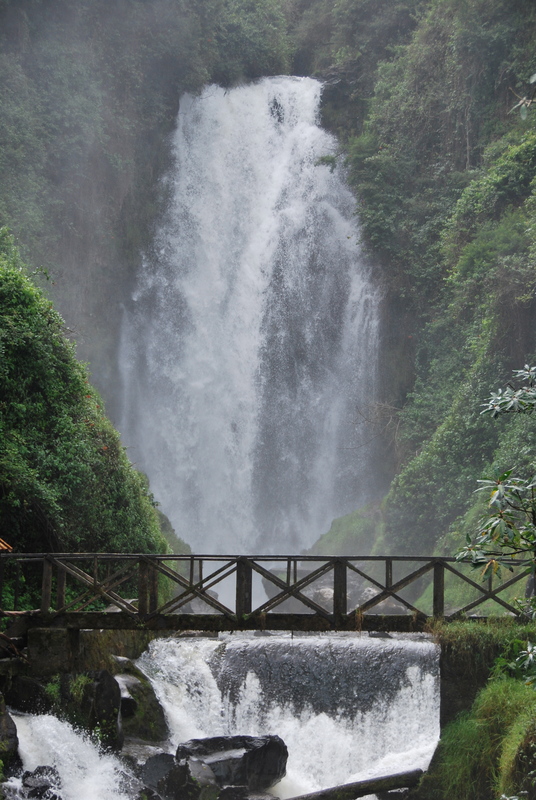 First, we boarded our instructors’ cars and headed to Peguche waterfall. It was a nice walk to the waterfall and it turned out that there was a second hidden waterfall. 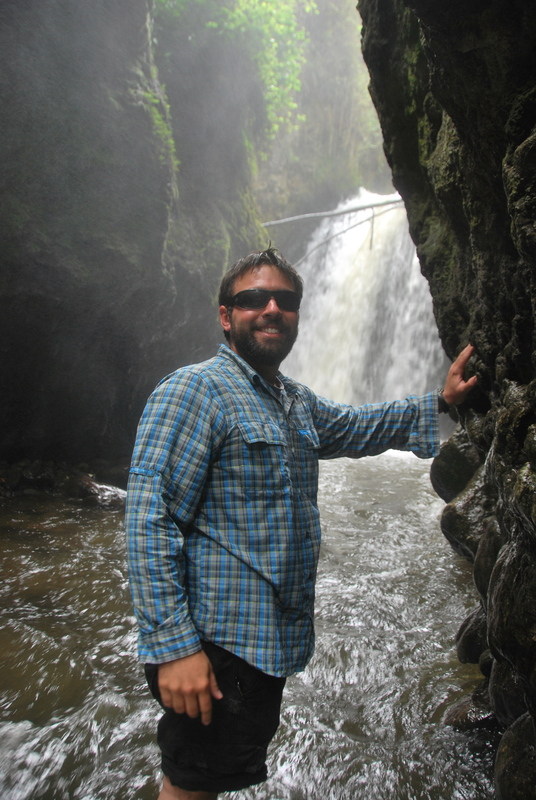 After climbing to the top of the main attraction, we shimmied through a tiny tunnel, shed our socks and shoes, and forged the river to a the more secluded falls. 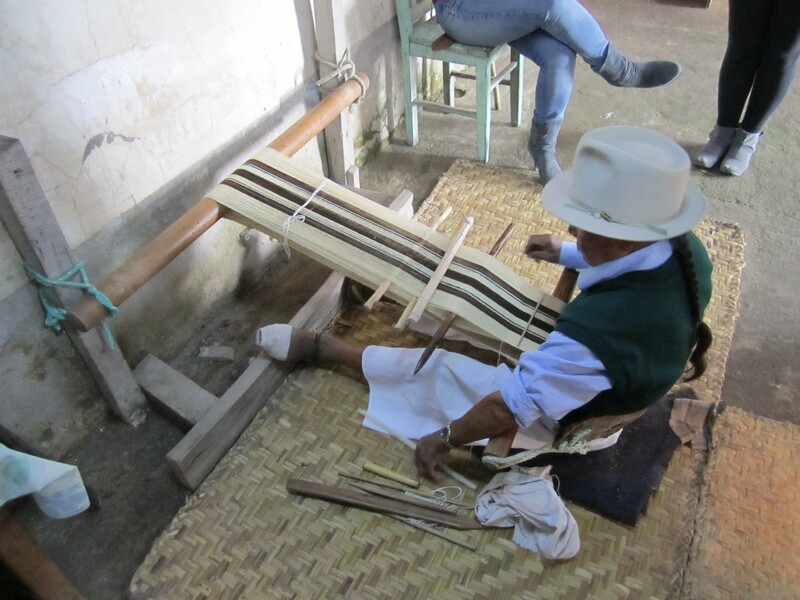 After getting misted by the waterfalls, we headed of to another artist’s workshop and we watched him work the loom and create some works of art. His process was a bit more modern than the one from the previous day. We also learned how one small insect is use to create the different colors. With the help of salt and lemon juice, the colors changed before our very eyes. Interesting and a bit Mr. Wizard. The artist had created so many unique and amazing pieces of art that we were sad that we did not have room in our bags to bring any home. Our final stop for the day was at a house of musicians where they also made musical instruments, mainly the famous flutes. Skillfully, our guide in this musical adventure crafted his own flute in less than 5 minutes, and then demonstrated the use of it and other types of flutes. To top it all off, he got together with a few buddies and they played some amazing music. 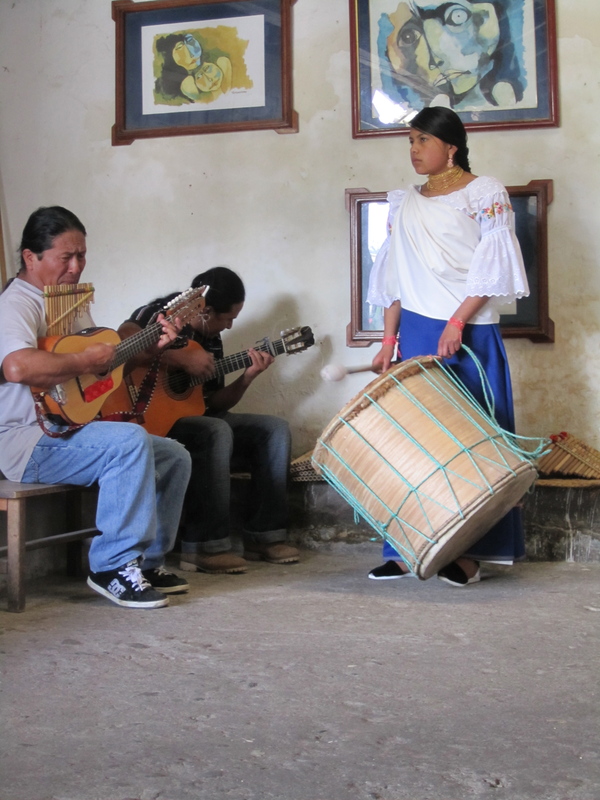 We were especially amazed and a bit jealous seeing how we have no musical skills of our own. Getting down! Can you guess who is having the most fun??? After our intensive week of classes, we both felt that our Spanish greatly improved and we learned a lot about this new area. Thanks again to our teachers! 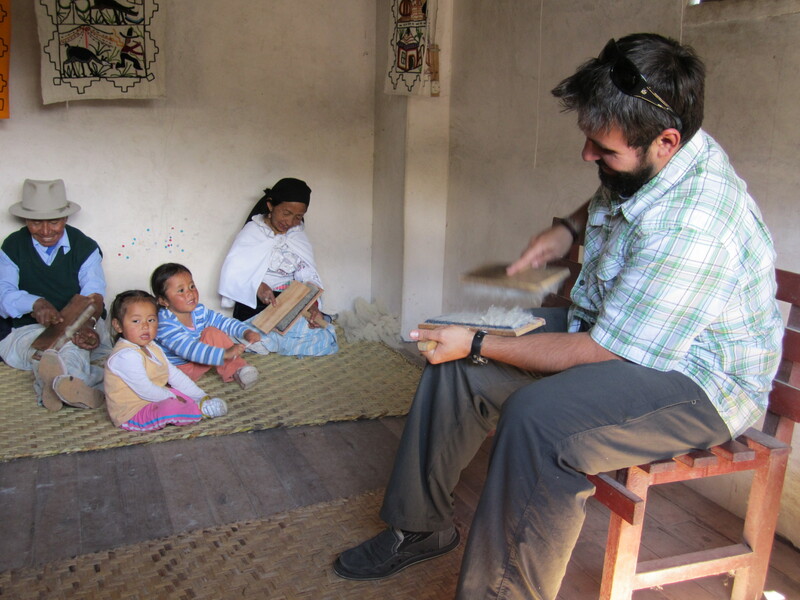 We hope to take classes again somewhere along the way, maybe in Bolivia. 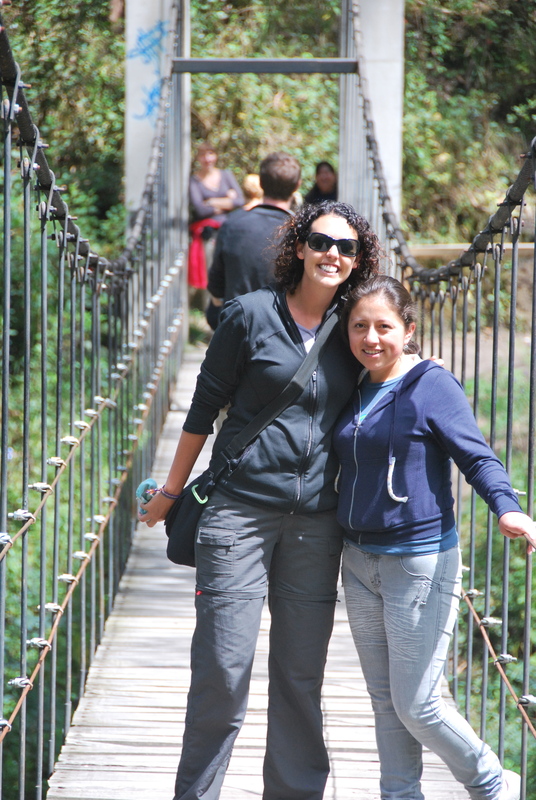 More of Otavalo to come! Cute dog! And that sling thing the woman is wearing is like the original baby bjorn. I hope the Spanish pays off when I’m there; I have tried practicing some Spanish, but the trips to Italy have given me a really dramatic accent.